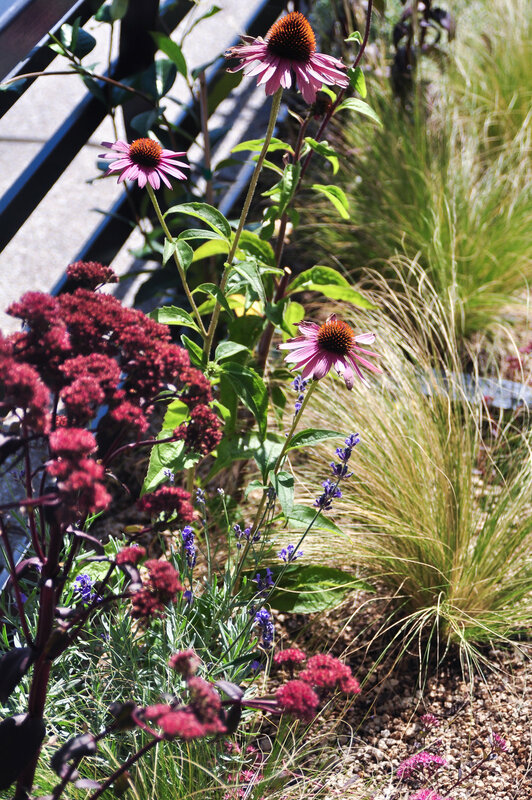 This rooftop garden overlooks downtown and the Willamette River, with breathtaking views of Mt. Hood and our Cascade mountain range. We designed and fabricated custom containers, selecting plantings that would complement the majestic setting, while also being well suited for the extreme microclimate of a rooftop. The design presented unique challenges, such as integrating the existing roof space, patio materials and layout. The client requested a year-round plant design that would reflect their extensive world travels, and so we created different zones with alternately tropical, desert and northwest specimens, such as Colocasia, hardy Opuntia, Mimosa and Azalia. Other specific requests were to create a dog-friendly zone and a spa-like area around the existing hot tub.